An old phone scam, and a particularly clever one at that, appears to be making the rounds again. What makes this one tricky is the caller will only ask you for one small piece of information: the 3 digit security code on the back of your credit card. The rest of your personal information (street address, phone number, and sometimes credit card number), they already have access to. 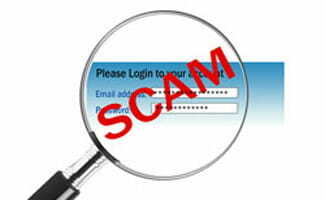 Find out what you can do to avoid getting scammed this holiday season. Credit Card Security Scam – Don’t Fall for it! You’ve got to love it when the scammers disguise themselves as a legitimate entity. In fact, in this scam, they act like they are calling from your credit card company (Mastercard or Visa), and are letting you know that you’ve been fraudulently charged, and what you can do about it. According to reports we’ve received, Royal Bank received this communication about the newest scam. This is happening in the Midwest right now and moving. As mentioned, the caller provides you with all your information, except for the one piece of information they’re looking for, which is not uncommon when you call legitimate companies to verify your identity. After you say no, the caller then thanks you and states, ‘Don’t hesitate to call back if you do,’ and hangs up. You actually say very little, and they never ask for or tell you the card number. But after we were called on Wednesday, we called back. Within 20 minutes to ask a question. Are we were glad we did! The REAL VISA Security Department told us it was a scam and in the last 15 minutes a new purchase of $497.99 was charged to our card. We made a real fraud report and closed the VISA account. VISA is reissuing us a new number. What the scammers want is the 3-digit PIN number on the back of the card. Don’t give it to them. Instead, tell them you’ll call VISA or Master Card directly for verification of their conversation.. The real VISA told us that they will never ask for anything on the card as they already know the information since they issued the card! If you give the scammers your 3 Digit PIN Number, you think you’re receiving a credit; however, by the time you get your statement you’ll see charges for purchases you didn’t make. What makes this more remarkable is that on Thursday, I got a call from a ‘Jason Richardson of MasterCard’ with a word-for-word repeat of the VISA Scam. This time I didn’t let him finish. I hung up! We filed a police report, as instructed by VISA. The police said they are taking several of these reports daily! They also urged us to tell everybody we know that this scam is happening. I dealt with a similar situation this morning, with the caller telling me that $3,097 had been charged to my account for plane tickets to Spain, and so on through the above routine. We’ve received reports that this scam is also present in email form, although we have yet to confirm that. As always, don’t give out any personal or sensitive information to someone that gets in touch with you. Always reach out to the respective companies yourself (ie. initiate the connection). In this case, you could call VISA and Mastercard to verify the claims (and of course, they would turn out to be false). It’s probably not a bad idea to pass this on to your family and friends so they can avoid being scammed this holiday.